You are here: Home / Cuban Corner / Are Cuban Cigars the Best? At some point this was bound to come up. “Are Cuban cigars the best of the best?” Certainly their reputation puts them on the top of cigar connoisseurs lists – even if they are illegal in this country. You have probably heard cigars toting the phrase “Made from Cuban seed”. Although this certainly sounds attractive, at this point, most cigar tobacco has come from that origin. Cuban tobacco seeds left Cuba nearly a century ago. A good portion of Cuban cigar’s reputation has been handed down over time. One thing is for sure; a lot of growers have improved and created great cigars in the interim. Are they worth it? In order to address this, let me at least bring you up to speed on a few things that make Cuban cigars unique. 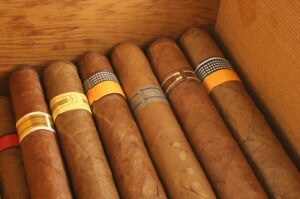 As we have mentioned before, most cigars blend several different tobaccos. This is an art in itself (similar to blending grapes to create a good wine). In the hands of an artist you can end up with some incredible cigars. It can also help if some of the tobacco is, shall we say “less than perfect”. Cuban cigars, however ONLY contain Cuban tobacco – always have and probably always will. It is not to say that Cuban cigars could not benefit from “blending” with other cigars – in some cases it would certainly help them in the lean years when weather conditions work against the grower. A good Cuban will accomplish something that is very difficult – a very full-bodied cigar that is still smooth. Not all cigars coming out of Cuba are full-bodied cigars. However, chances are, if you are new to the world of cigars, you may not like a Cuban. As your cigar tastes change, envision how you may have changed your taste in wine. Most people start with a sweeter wine such as a Zinfandel or even (gulp) wine “coolers”. Then you may move into sweeter chardonnays and then dry chardonnays then something light from the red family (merlots, pinots, etc). Eventually after much “research” your taste buds may have you drinking mostly Cabernet and Bordeaux. Cigars work much in the same way. You may start out with a mild cigar and some time later work you way up to a full-bodied smoke. That may be the point that you introduce Cuban cigars. Fun Fact: You can try Cuban cigars almost anywhere outside the US. Be sure to look for a reputable dealer, as they are lots of fakes out there. I have heard stories of people bringing them into the US by simply taking off the rings and throwing away the boxes (just no way to verify that the cigar is from Cuba). The legal route would be to talk to your local tobacconist and ask him about “Pre-Embargo” Cubans. These are cigars where the tobacco was brought into the US BEFORE the embargo (1962). This also gives you a great chance to try and aged cigar – expect to pay about $30. In the end, and I can only speak from a personal standpoint, Cuban cigars can be great (if you get a good one). However, I don’t know that they are always worth the price. You can spend anywhere from $30 – $50 for a Cuban cigar. Special occasion, yes. But if you are looking for a better use of your money, you may want to invest in 5-6 great cigars that are not from Cuba. Ready to try one? Too many to list here but I would go with a Trinidad Extra Robusto or a Cohiba Esplendido. Both are Flagship smokes for Cuba and seem to have the best quality of tobacco the country has to offer.